The first time I saw the Western Wall was in 1973. We were on a family vacation to Israel, and on the eve of my 11th birthday our family made its way to the Old City. The Wall was so imposing, and I saw all these notes pouring from the cracks and crevices of the stones. I had this sense that the Wall held the emotions of the Jewish people for 2,000 years. I vividly remember touching the Wall, and imagining how other Jews felt as they journeyed to Jerusalem, to be in the Holy City and to experience the holiness of this place. In those days, there was not much to the Plaza area of the Western Wall and the Jewish Quarter was not developed as it is today. Israel had only controlled the Old City for six short years. The focus was not on the Wall as a religious site, but the Wall was a symbol of the Zionist dream of establishing a strong Jewish presence in the land of Israel. I remember feeling that my being in the Old City was part of the story of the Jewish people. I belonged. As an adult, I have never enjoyed going to the Wall. I have always felt alienated. The Western Wall became an Orthodox synagogue with a strictly enforced mechitza. Whenever I would go to the Wall, I felt like I was fighting. Someone was always yelling at me to dress more modestly. If I came to the Wall with a group of women, I could never hear our prayers. Our voices were always being drowned out by others who shouted and who were determined to muzzle our prayers. Many many times I came to Jerusalem and I didn’t bother going to the Old City. I avoided going, not because I was afraid of encountering Arabs or “the situation,” but because I felt no emotion when I went to the Wall and I was angry at the Orthodox establishment that belittled my presence. This week, for the first time in my adult life, I had an incredible experience at the Western Wall. I want to thank my daughter, Nina, who has always been interested in Women of the Wall (WOW). She learned about their work many years ago when she was responsible for sharing current events with her classmates at Heritage Academy. When Nina and I visited Israel a few years ago, we went to the Wall, and the experience was underwhelming. Nina didn’t relate to the stones and wondered what all the fuss was about. But she also continued to follow WOW, and she routinely asked about attending a WOW Rosh Hodesh service. As it happened, Rosh Hodesh coincided with Nina’s class trip to Israel, and I was finally able to take Nina to a spirited and inspiring service at the Wall. who wanted to celebrate the recent decision to set aside a portion of the Western Wall for mixed prayer. Going through security was a hassle. 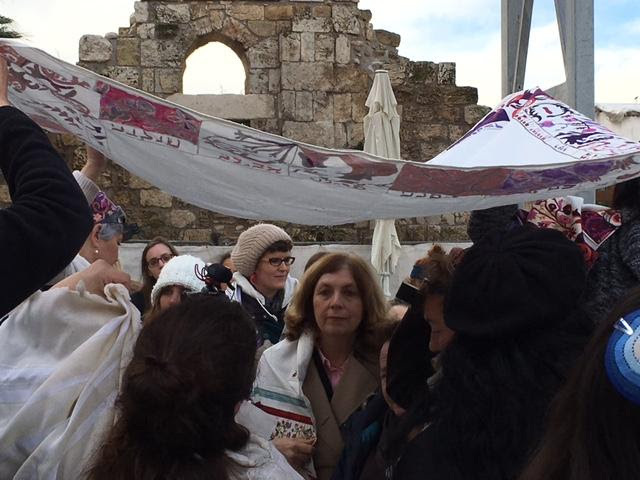 While others walked through security easily and quickly, those of us who were with Women of the Wall were briefly detained. It was irritating and a reminder that we were doing something frowned upon by many. The security guards carefully examined my tallit and tefilin, wondering why a woman was carrying such items. The staff of WOW were similarly detained and their ritual prayer belongings examined. avoided this source of potential conflict. Instead of reading from a Torah, we read from a piece of klaf (parchment) which contained the Torah reading for the morning. Morning services at the Wall had just begun. that my daughter took an interest in the service. I loved that she wanted participate and could navigate the siddur. 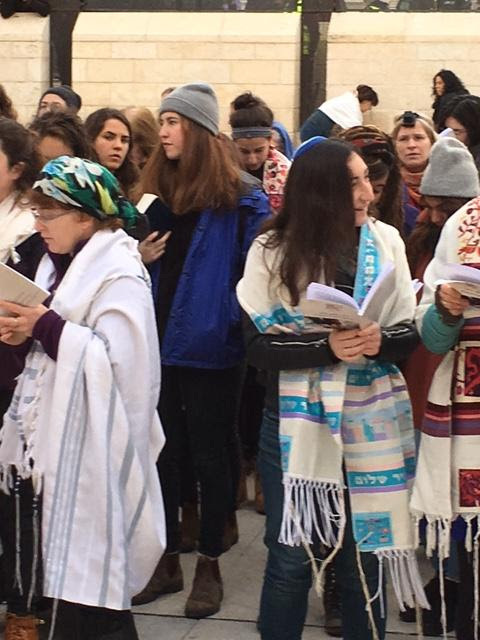 As a Jewish woman, I felt connected to the other women davening. Once again, I had a place at the Wall. I belonged. Of course there were passerby who mocked our prayers, but for the most part we were well-received and our space was respected. There were three moments of the service that made a deep impression on me. Throughout the service, I kept looking at Nina. I could tell that the morning really mattered to her. 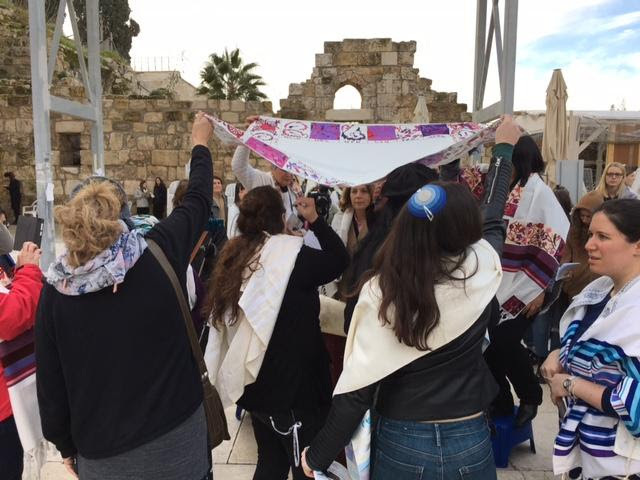 She loved the prayer shawl that I had bought for her from Women of the Wall in honor of our participating in the service. I knew that the experience would be one she will cherish for the rest of her life. And I couldn’t help but think about the July evening in 1973. My mother and father gave me the gift of experiencing the Wall, and now I was able to do the same for Nina. voices were unified and strong. I couldn’t help but remember another time I recently felt the power of this text. I was in the remnant of a synagogue in Pinczow, Poland where many verses from the psalms had been painted on the walls of the synagogue. While standing in the arched doorway leading into the sanctuary, I began to sing. Soon others were singing with me, and the synagogue was once again filled with Hebrew song. Standing in the women’s section of the Kotel Plaza, I drifted back to Pinczow. I felt the power of the Jewish story. We are a resilient people and our voices will be heard. I felt as though my participation in the WOW Rosh Hodesh service honored those who perished in Pinczow. Not only would Judaism continue to survive, but it would thrive. We concluded our Rosh Hodesh service by singing Hatikvah. Often when I hear the tune to Hatikvah, I become emotional. I am mindful that for my grandparents there was no Jewish State, and I am always appreciative that I have witnessed the rebirth of the Jewish people in our homeland. This miracle always inspires me. Anat Hoffman taking the first aliyah, celebrating the government’s decision. themselves freely in our own homeland. I watched as Anat Hoffman, an Israeli activist and Executive Director of the Israel Religious Action Center, stood next to Beatrice Safron, a modern Orthodox woman, and a special friend of WOW. At the moment, I appreciated the magnitude of the alliance. Women and men from different religious perspectives stood together for nearly a quarter century in an effort to shape the direction of Israeli society. I became grateful not only for the vision and leadership offered by Anat Hoffman, but for the community that made the morning possible. Critics are very upset that the space will not be in the Kotel Plaza itself, but rather a few hundred feet away. They see this not as a compromise, but rather as a failure. At first, I wasn’t sure how I felt about the deal. On the one hand, I was so grateful that the government finally recognized the rights of non-Orthodox Jews. On the other hand, I worried that this was a bad deal and should be rejected. We Americans know all too well, separate does not mean equal. But after attending the service and being here, I have decided that I support the deal. 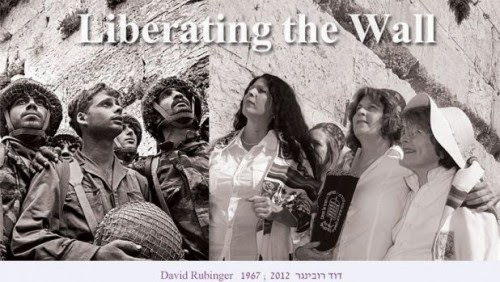 Since 1988, a group of women have been challenging Israeli society to recognize an egalitarian expression of Judaism. Finally, these efforts have been recognized. On the left is the iconic photo of IDF soldiers liberating the Wall during the Six Day War in 1967. The photo on the right is of Anat Hoffman and Beatrice Safron, taken in 1988. Porush announced that women who come to the Kotel to pray together should be “thrown to the dogs.” Moshe Gafni, an ultra-Orthodox lawmaker who chairs the Knesset’s Finance Committee, called Reform Jews “a group of clowns.” Yariv Levin, Israel’s Minister of Tourism, bashed Reform Jews from the United States, calling them part of “a dying world.” Tourism Minister Levin’s comments were bizarre, given the fact that Reform and Conservative Jews are one of the largest groups of Jewish tourists to Israel. Prime Minister Netanyahu immediately condemned the offensive remarks by these government officials, calling them “disparaging and divisive.” This is not to be taken for granted, even though it ought to be. I have decided the agreement is a huge step forward. Rather than complaining that the the egalitarian space is not in the Plaza area itself, I prefer to thank the Prime Minister for the support he has extended and to encourage him to continue keeping his ministers in check. Netanyahu should do everything he can to prevent members of the government from demeaning progressive Jews who love and support Israel. Please click here to send a message to the Prime Minister, thanking him for advancing pluralism and equality and for standing up to bullies. Let’s give him the credit he is due, while also demanding that he take even stronger steps to stand up to those who attack liberal Judaism. 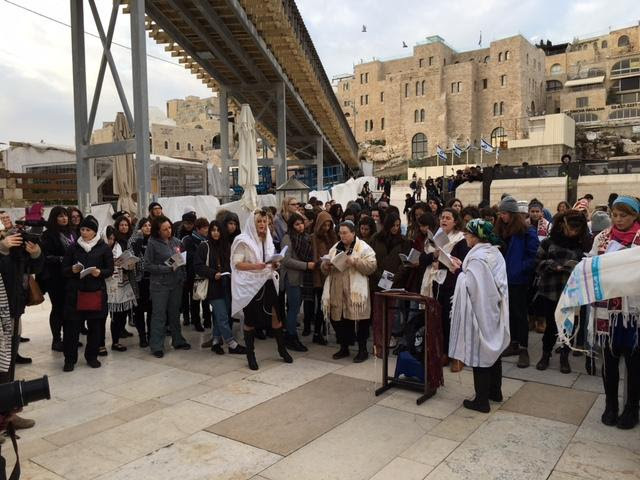 Centuries from now, Jews will regard the place set aside by last week’s decision for non-Orthodox prayer as part of the Kotel. As we sanctify the new area by praying there, by touching the stones and inserting our prayers into the Wall’s cracks, we will make a new sacred space. Sometimes a small compromise achieves an enormous victory.